Good Evening Charleston West Virginia!!!! 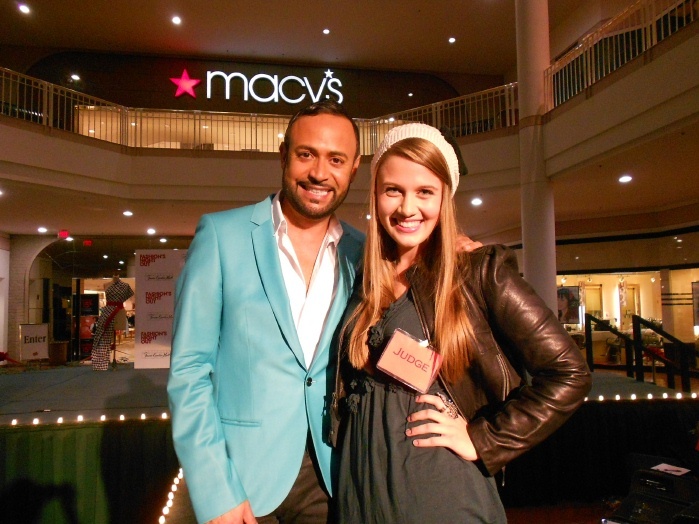 As everyone knows, last Thursday night, September 8th was Fashion's Night Out. 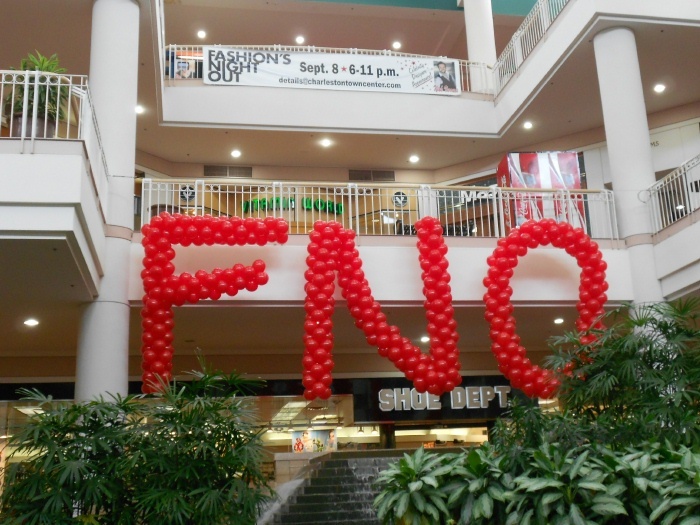 As part of the FNO Shopping Celebrations, I was invited to host a Fun & Fab event in West Virginia!! So, last week, I left 100 Degree Heatwave-weather Los Angeles, threw on my trench coat and scarf and flew to much cooler climates: Charleston West Virginia (it was in the 60s-low 70s Thank Goodness!!). 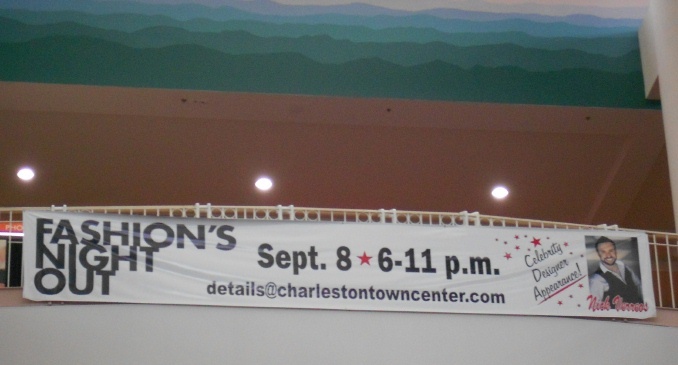 I was invited to host a Fashion's Night Out Event AND a Project Style 2011 Competition at the Charleston Town Center Mall. As everyone knows (if you've been reading here on my BLOG), I've been hosting several of these Project Style "Style-Off's" and this time, it took me to "John Denver Mountain Momma"-Country! After a long flight (it's not easy to get there from LA), I arrived to an awaiting long stretch white limo (!) which then took me right to my hotel where I got some pre-event sleep. The following day, I had a delicious "VIP" Luncheon at Tidewater Grill, where I met the charming Lisa McCracken, CTC Marketing Director and Project Style Co-Producer (LOVE HER!!!) 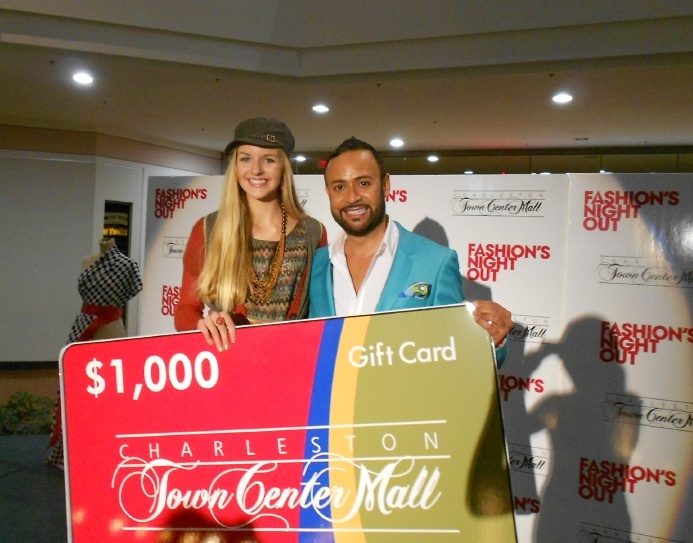 plus several of the judges of the night's Project Style competition--including Laura Sheets Cosmetics Manager & Macy's Charleston Town Center Mall Fashion Director, Stephen Smith, the Assistant Manager at Gap, and Jennifer Miller, Owner of Mission Savvy Boutique. I passed this wondrous display of red balloons spelling out "FNO" (for Fashion's Night Out" of course) PLUS a HUGE banner with my photo above it...right IN THE MIDDLE of the Mall! (Oh Lordy!). The "Southern Hospitality"--technically, West Virginia is considered "The South"-- didn't stop there. Once in my Pre-Event "Green Room", the organizers had many, many newspapers showing the ad and promo of the event--all reserved for my taking--PLUS... Lisa McCracken's (The CTC Marketing Director) AMAZING Assistant, Katrina (LOVE HER Part 2! ), had created a "Nick Board" with photos not just of me (Oh Lord!) but many many of my NIKOLAKI dresses and my Celebrity Clientele wearing my NIKOLAKI dresses on the Red Carpet! She even included a photo of "my" Project Runway MyScene Barbie AND a picture of me and my precious doggie, Benny!!! (Awwww! Yes, I was clutching my pearls huney!). 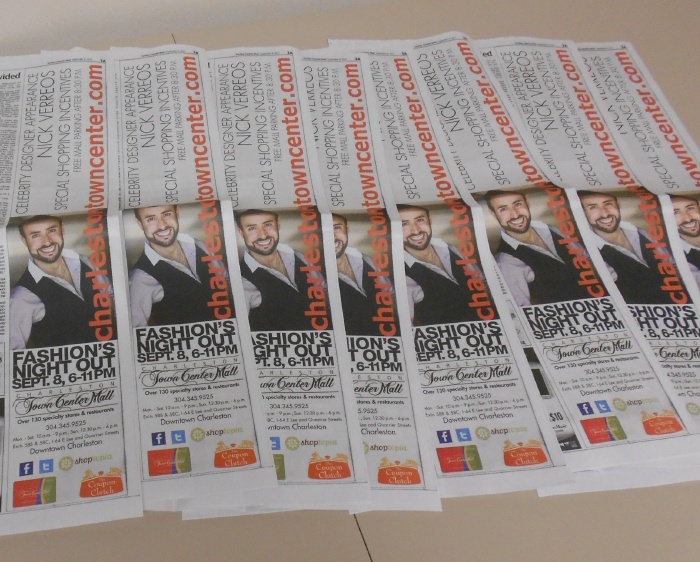 I autographed it and hopefully, that's hanging prominently in someone's office at the Charleston Town Center! Soon, it was SHOWTIME. Project Style, in case you didn't know, is a contest sponsored by shoptopia.com where budding stylistas apply online, send their photos and go through a selection process where they get chosen through different "rounds" of voting. The Top Five, then come to the Finals, where in Charleston West Virginia's case, I then gave then each a $200 CTC Gift Card, and ONE HOUR, to shop for an entire outfit, and come back...for a LIVE Style-Off. 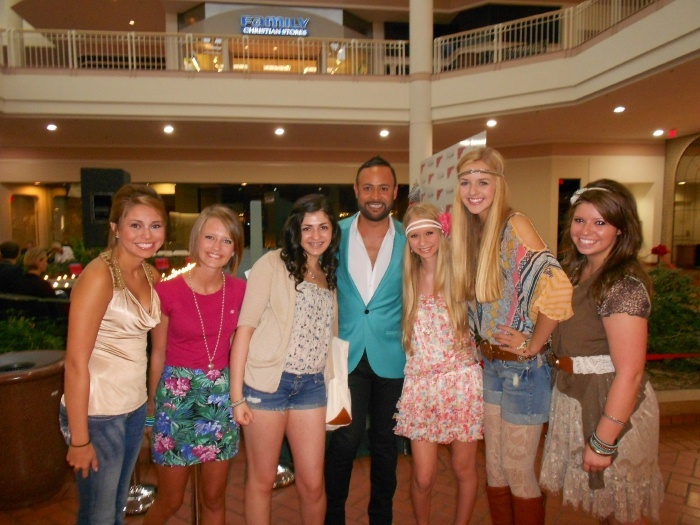 The Finalists were Alyce Crist(pink top, flower-print skirt), Hennah Vogel (denim shorts), Kenzie Fry (headband & flower-print dress), Amelia Edmondson (Boho-Hippie Chick) and Taylor Ingram (white belt), seen above with me and last year's Project Style Winner, the beautiful Simran Walker (far left). The judging was very CLOSE but there could only be one winner. 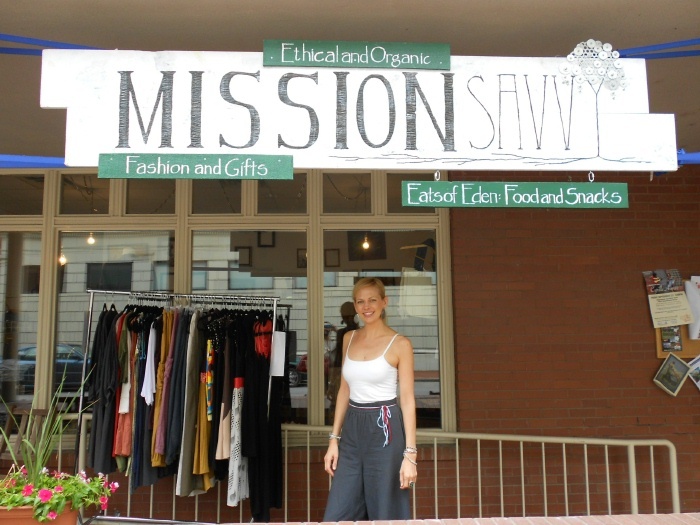 The Project Style 2011 Winner was: Amelia Edmondson (above)! 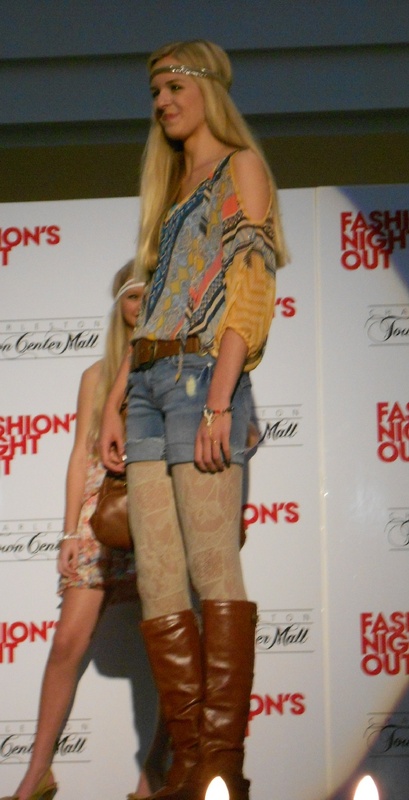 She was very tall (5'10"+) and styled herself with a very "Boho Hippie Chick" ensemble including denim shorts, stretch lace leggings, brown knee-high boots, multi-colored and multi-printed tops, a cute headband, various jewelry, all for under $200! 0 Response to "NICK APPEARANCES.....Fashion's Night Out, Project Style Charleston West Virginia: RECAP"